Little Moran has comfortable accommodations, extensive bird coverts and impressive English setters. Author's photographs. For sportsmen in the Upper Midwest and New England, grouse and woodcock hunting is as American as mom and apple pie. But to Western hunters like me, it is somewhat of an oddity. No wide-open spaces, no mountains to climb and, for sure, no open vistas. It’s hunting in thick cover, and it’s all about good dogwork, explosive flushes and snap shooting. Along these lines, I recently enjoyed a three-day grouse and woodcock hunt at Little Moran Hunt Club, in Minnesota. Before I arrived, owner Steve Grossman warned me that grouse numbers were low and that we would have to work to put birds in the bag. Grouse populations in the Upper Midwest run in seven- to 10-year cycles, and anyone who hunts the birds knows where the cycle is during any particular season. When I spoke to Grossman, he said that the cycle was not at its lowest, but it certainly was toward the bottom of the spectrum. Then he followed up by saying, “You should have no problem filling your woodcock limits each day, though.” So with reports of both bitter and sweet, I booked a trip in early October when the woods would be awash with the yellows and reds of falling leaves. Grossman and his wife, Gayle, have operated Little Moran since 1984. They offer grouse and woodcock hunting from late September to early November and have a 320-acre pheasant preserve that operates from September to April. Located near the town of Staples, Little Moran is only a two-hour drive from the Minneapolis/St. Paul Airport. Little Moran has four guides, including Steve, who take two hunters each within a 50-mile radius of the Club. In total, Grossman has access to more than 100,000 acres of grouse and woodcock coverts. Little Moran has some of the most impressive English setters that I’ve had the pleasure of hunting behind. The dogs are outstanding bird finders, are steady to shot and are good at locating dead birds. Grossman has a kennel of 26 dogs and is a well-respected trainer and breeder in addition to being the consummate guide. On the first sun-soaked morning we drove about 20 miles to a covert that had the prefect mixture of alder thickets and stands of poplar and maple. Grossman put a pair of dogs on the ground and we were off. Within five minutes one of the setters was on point, and we followed the sound of its beeper collar to some thick brush. There we found one dog pointing and the other backing. As I walked in, a woodcock flushed nearly straight up, and I snapped my 28-gauge over/under to my shoulder and squeezed the trigger. To my surprise, the bird dropped. 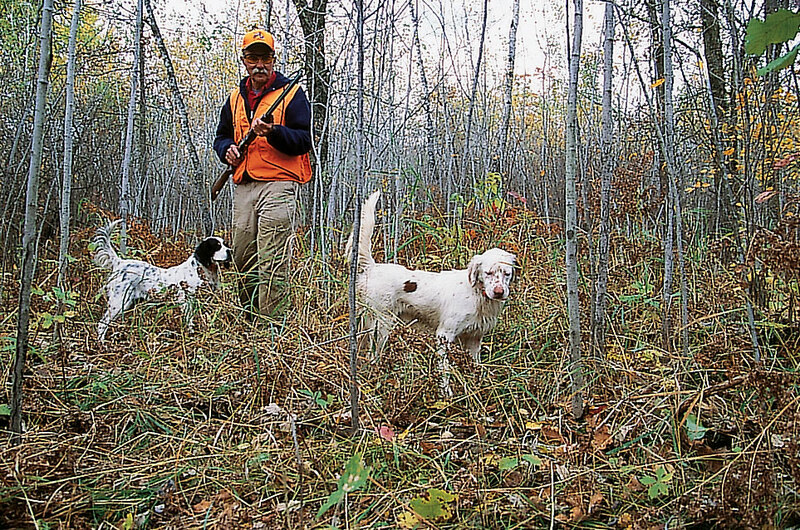 One of the dogs was sent to retrieve, and seconds later the day’s first woodcock was in hand. By the time we’d covered the section of woods Grossman referred to as his “woodcock honey hole,” my hunting partner, Alan Sands, and I had five birds in the bag but had yet to see a grouse. A 20-minute drive brought us to a covert that Grossman was sure would hold grouse. The guide released a fresh pair of dogs, and we followed them down a logging road. Fifteen minutes later the dogs went on point, and a grouse flushed from the dense cover. Sands managed to drop the bird as it passed through an opening. And so it went for the rest of our trip. As Grossman had predicted, we found it relatively easy to take our daily limits of three woodcock. Grouse were more difficult to find, and we ended up bagging a total of two to four birds each day. We missed our share as well, averaging 30-plus woodcock flushes and 16 to 18 grouse flushes per day. 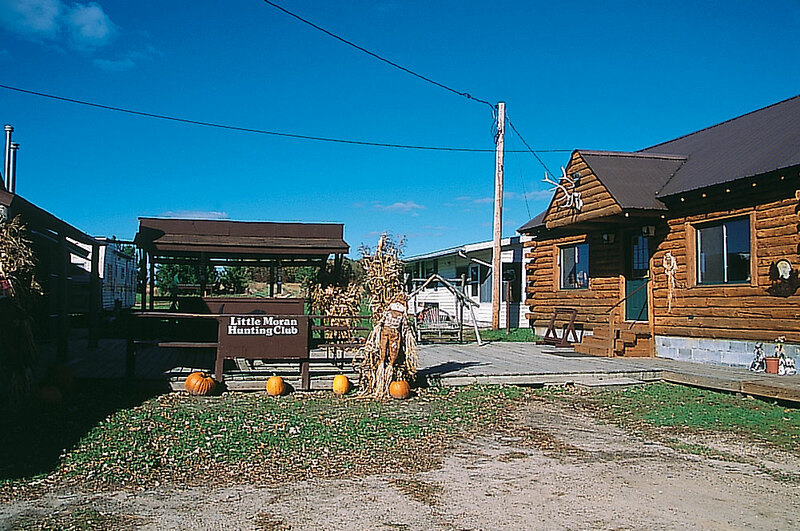 Little Moran’s hunts include local transportation, guide service, accommodations and meals. There is no minimum stay, but most hunters sign on for three days of gunning. A maximum of eight hunters can be booked at a time. Accommodations are in a comfortable farmhouse with seven double rooms, several with adjoining bathrooms. Meals are served in the main clubhouse, and Gayle and the ladies in the kitchen do a superb job producing gourmet dishes. For more information, contact Steve Grossman, Little Moran Hunt Club, 218- 894-3852.